Are you looking for a unique way to celebrate a special occasion such as a birthday, bachelorette party, date night, or just a fun group outing? Suede Ink Studios host the Ultimate Sip & Paint classes... Discover your inner artist while having a good time with your friends/family/coworkers. 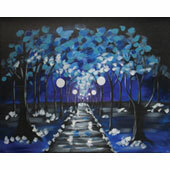 get ready to enjoy the relaxing experience of canvas painting along with a glass of wine. Even if you have never held a paintbrush before, beginner, intermediate, or advanced you will walk away with a piece of art that you will be proud to hang in your home or gift to a friend. Book a private class or view our ongoing class schedule.